Nigeria ranked 11th in their continent and 67th in the world were less fancied to make it to the world cup finals in a group comprising the top-most ranked team in the continent Algeria and 4th ranked team Cameroon both were present in Brazil 2014 World Cup and a rugged Zambian team, romped through the toughest of Africa’s 2018 World Cup qualifying groups with such ease. Be it as it may, this current young Nigerian squad remain a side in need of improvement. 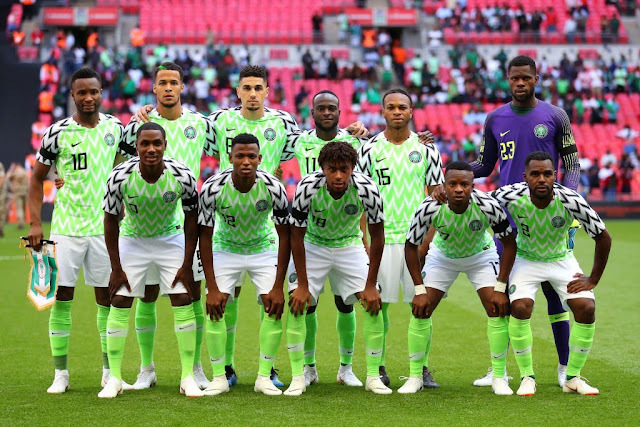 a set of inexperienced young squad players appart from skipper John Obi Mikel and few experienced players, much shuffled from the lllate Stephen Keshi's lead team that reached the second round at the last World Cup in Brazil. Young prodigies Alex Iwobi and Kelechi Iheanacho are yet to live up to the impact that has been expected of them, although Iwobi scored the sole goal in the 1-0 win against Zambia which was vital to secure World Cup qualification. Nigeria are in a tough group tagged group of death alongside Argentina, the less populated Iceland, and a star studed Croatia. The Super Eagles of Nigeria will open their World Cup campain against Ivan Rakitic‘s Croatia on the 16th of June. Later on June 22nd which is six days on, they play Iceland. And finally close their group stages with Argentina on the 26th in Saint Petersburg. Chelsea star Victor Moses proved in the road to the world cup finals that Nigeria are one level up on their ability when he plays. Captain John Obi Mikel remains the back bone of the midfield, A more direct and attacking midfield role than he did at club level. Full back Leon Balogun has not been around long but has really influenced the team positively with defense partner William Troost-Ekong are the defensive bulwark in a relatively inexperienced back four. Goalkeeper Carl Ikeme (First-choice) has not featured for the team the sad news came in July last year that he had been diagnosed with acute leukemia. DEFENDERS: Abdullahi Shehu (Bursaspor) William Troost-Ekong (Bursaspor), Tyronne Ebuehi (Ado Den Haag), Bryan Idowu (Amkar Perm), Chidozie Awaziem (Nantes FC), Elderson Echiejile (Cercle Brugge KSV), Leon Balogun (Brighton), Kenneth Omeruo (Kasimpasa). MIDFIELDERS: John Mikel Obi (Tianjin Teda), Joel Obi (Torino, Italy), Ogenyi Onazi (Trabzonspor), Wilfred Ndidi (Leicester City) ,Oghenekaro Etebo (UD Las Palmas), John Ogu (Hapoel Be’er Sheva). FORWARDS: Victor Moses (Chelsea), Ahmed Musa (CSKA Moscow), Odion Ighalo (Changchun Yatai), Kelechi Iheanacho (Leicester City), Alex Iwobi (Arsenal), Simeon Nwankwo (Crotone).